Recently, when my almost-5-year-old nephew requested a black hat to go with his school uniform, I was at first a little disappointed. Like most knitters, I’m generally drawn towards vivid colors — black is for boots and store-bought cardigans, amiright? — and I figured I’d also have to go with a very plain pattern because any interesting detail would get lost in black yarn. Then I remembered that a bunch of dyers have black colorways, so I went clicking through the Indie Untangled marketplace to see what I could find. 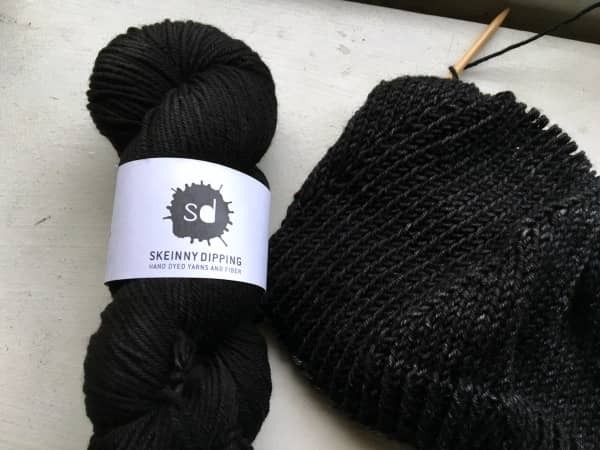 I ended up contacting the lovely Christine of Skeinny Dipping, who had actually, a few months ago, suggested her new Cease and Desist color as one of the stripes for my Nangou (I ended up going with pink and teal to match Duck Duck Wool’s Night Bokeh). Christine dyed up two skeins of C&D on her Journey Worsted base, one of which I’m using for Stephen West’s Windschief — it’s just complex enough without having anything go missing in the darkness. What made you decided to create a black colorway? If you look in my closet you will find a lot of black. My dresses are black (or a really dark color), my store-bought cardigans are black, etc. My husband says I always look like I’m ready for a funeral. I like it because it matches everything easily and the last place I want to spend time at is a clothing store. But while there’s black everywhere in store fashion there isn’t a lot of black in the yarn world — certainly not enough for me. Ask me to pair two colors together? I can do it but I’ll really want black to be one of them. Three colors? 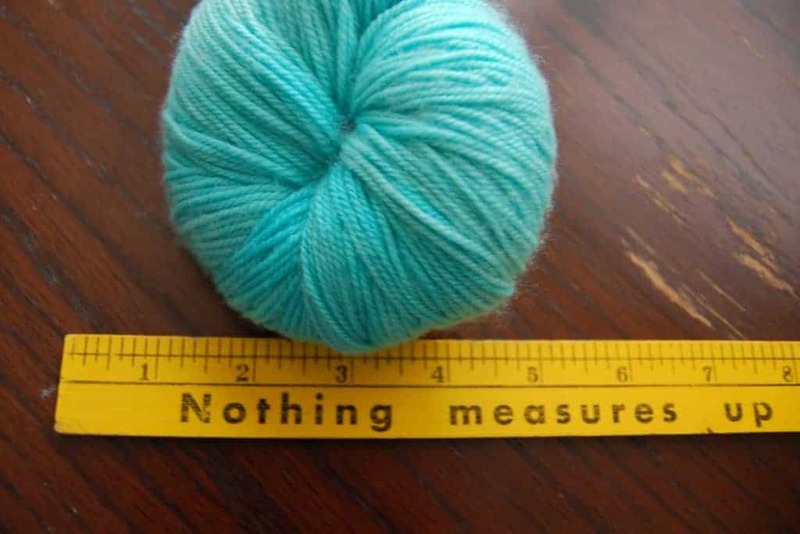 Impossible (this is why I still haven’t knit a Color Affection). I need one of them to be black so the scarf goes with my cardigans and dresses. Voila! Cease and Desist was born. Without giving too much away, how does one actually create a shade of black? Do you use black dye, or is it a combination of other colors? Like any other colorways it depends. My Cease and Desist is very simple — one dye. But you can create very beautiful blacks — just have a look at Blue Moon Fiber Arts. They have an amazing line of blacks in their Raven Clan series. Is it challenging to give a black colorway “depth”? Again, it depends. Are you going for a semi-solid black, a tonal, or something using a resist? I feel like tackling a black color presents the same challenge as any other color. What pattern suggestions do you have for black yarn, with it either as a main or accent color? For an accent color, I love Aileron by Dieuwke van Mulligan. Colorwork projects are also great for black, like Pointy Pointy Mittens by Adrian Bizilia or Jazz Hands by Kate Davies. Stripes are great, too: Accelerating Stripes Fingerless Gloves by the Churchmouse Yarns people, Mon Petit Gilet Raye by Isabelle Milleret. And anything brioche. I also use black for the heels on a lot of my hand-knit socks. This entry was posted in Color and tagged dyeing, hats, indies, interview, patterns, yarn.